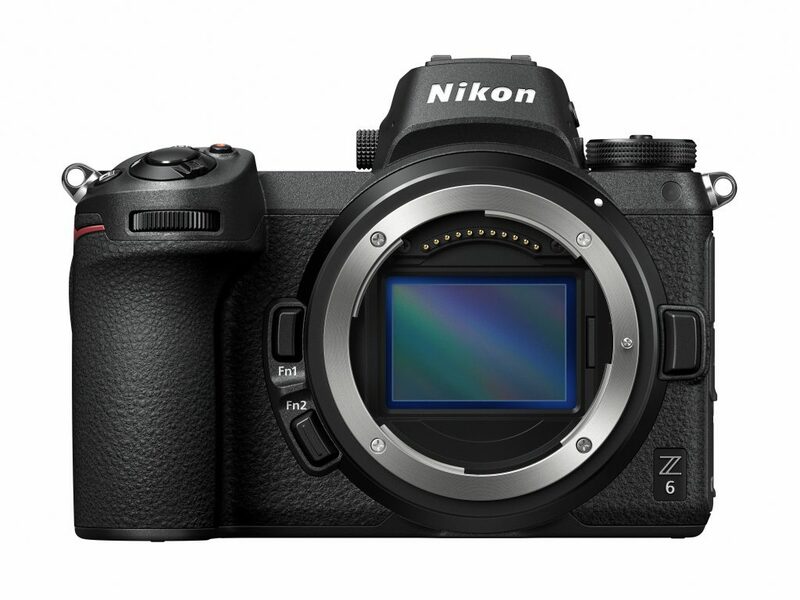 The Nikon Z 6 is a mid-range mirrorless model in the company’s new Z series. Besides adopting the latest full-frame 24.5 MP BSI-CMOS sensor, the Nikon Z 6 hosts a wide range of features, including a hybrid AF system with 273 on-chip phase-detection points and 90% coverage, as well as built-in 5-axis image stabilization. The magnesium alloy body is weather-sealed and the design, particularly around the grip, is reminiscent of Nikon’s current semi-pro DSLRs. At the rear, the Z 6 features a tilting 3.2-inch, 2.1m-dot touchscreen LCD, while the electronic viewfinder features a high-res 3.68M-dot panel. The Z 6 can capture up to 12 fps in a burst (AE locked, 12-bit only) and at up to 5.5 fps with continuous AE/AF recording to a single XQD card. It can also record 8-bit oversampled UHD (4K) video without a crop factor internally (10-bit Log externally over HDMI), and features such aids as focus peaking, zebra patterns, and time code. The Z 6 also has a range of wireless connectivity options for stills that includes Wi-Fi and Bluetooth, as well as the ability to connect directly to a computer using a supplied USB-3 cable. 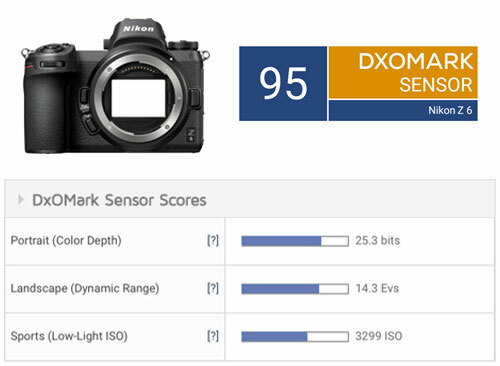 The Nikon Z 6 24.5 BSI-CMOS sensor achieves an overall DxOMark score of 95 points. Its key strength is its low-light ISO (Sports) score of 3299 ISO, which ranks it closely with the best of the commercially-available 24 MP sensors we’ve tested, and making it a “must-have” when light levels tumble and high ISOs are the order of the day. Offering an excellent dynamic range and color depth at base ISO of 14.3 EV and 25.3 bits, respectively, the Z 6 is ideal for a wide range of genres, including landscape, studio, portrait, and street, and even editorial photography and news gathering, when all but the highest resolution is required. At base ISO, the Nikon Z 6’s color discrimination and dynamic range is on par with the best 24 MP full-frame sensors, such as the mirrorless Sony A7 III and the company’s own D750 and D610 DSLRs. 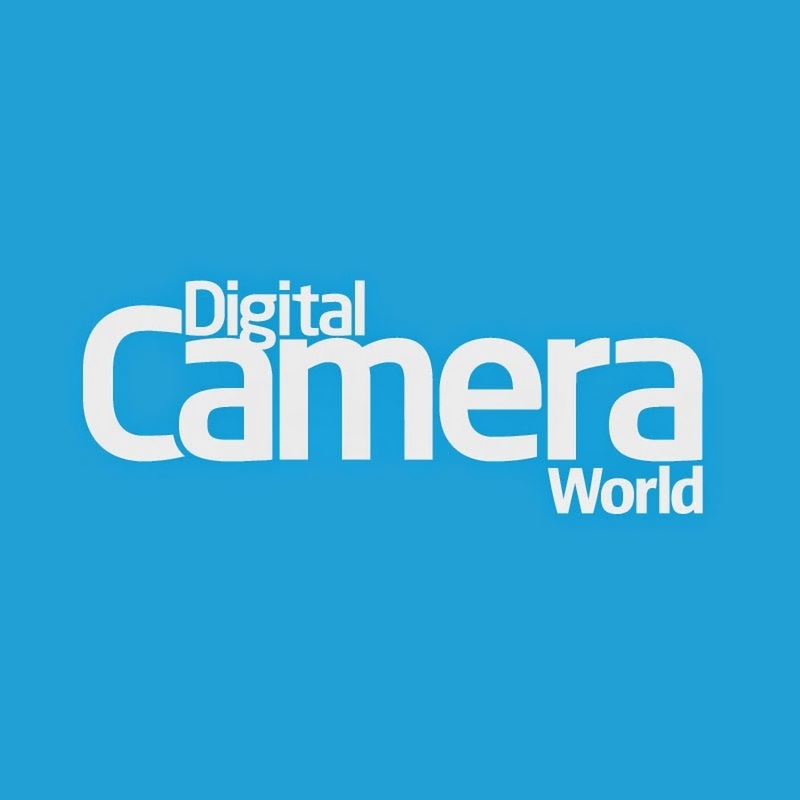 As for the second and third generation of higher-resolution full-frame sensors such as those found in the Nikon D810 and the Pentax K1, as well as in the Nikon D850 and the Sony A7R III, the Z 6 falls a little behind in the rankings, but that’s mainly due to the wider performance range stemming from those sensors’ lower base ISOs. As for low-light ISO performance, with the exception of the Pentax K1 and the Sony A7R III, most of the cameras with higher-resolution sensors listed above can’t match the signal-to-noise ratio of the Z 6’s larger pixels, where it is very close to the best-in-class 24.2 MP Sony A7 III. 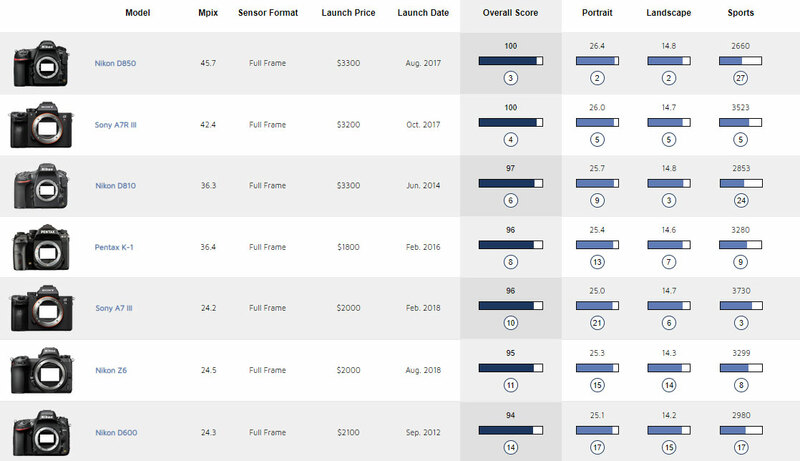 For a more detailed examination of sensor performance, our in-depth analysis takes a closer look at the Nikon Z 6’s scores compared to those of a similar-resolution full-frame competitor from Sony, as well those from the sensor in the current mid-level Nikon DSLR. Our Portrait (color depth) results, derived from a RAW image displayed on screen at 100% (1:1), show little discernible difference in color discrimination between the Nikon Z 6 and the Sony A7 III, with the exception of a boost of the latter at and above ISO 51200 around the 10-bit mark. However, this boost is likely caused by a slight smoothing that Sony applies to its RAW files, thus artificially increasing the color sensitivity measurements. In real-life situations, differences between the Z 6 and the A7 III wouldn’t be noticeable. There’s little difference between the Z 6 and the D750 either, though there’s some mid- to high-range improvement of around 1 bit from ISO 400 at ISO 12800 (manufacturer’s setting), which while slight is still welcome. Overall, though, all three have very good color responses. On-screen results show a marked difference in dynamic range between the Nikon models, though the Z 6 and the D750 share similar values from base to ISO 400. After that point, the Nikon Z 6 has on average around a 1 EV advantage through ISO 25600, after which the older D750 shows a slight uplift that brings the overall difference to around 0.7 EV in favor of the newer Z 6. When compared to the Sony A7 III, we see the new mirrorless rivals sharing a very similar dynamic range throughout, although the Nikon displays a noticeable boost from ISO 400 to 800 range, giving it around a 0.5 EV advantage at ISO 400, which drops to 0.3 EV at ISO 800. The Sony, on the other hand, shows a more consistent slope over the more typically-used ISO settings. The boost at ISO 102400 is caused by the same smoothing already mentioned in the Portrait section. Again, comparing the results from a RAW image displayed on-screen at 100%, all three cameras share remarkably similar responses in their signal-to-noise output, with the Nikon Z 6 and Sony A7 III in particular offering low noise levels with excellent SNR results of around 32 dB at ISO 3200, and 20 dB at ISO 12800. With the introduction of the mirrorless Z 6, Nikon has adopted one of the best-performing full-frame 24 MP BSI-CMOS sensors. At base ISO, it has very good color and a wide dynamic range; additionally, the sensor has outstanding dynamic range at mid-ISO settings, and has particularly good low-light performance at high ISOs. Even though it performs exceptionally well in our tests, the Z 6 is still only slightly ahead of the sensor in the 2014 Nikon D750. Nevertheless, while we can’t gauge the impact of its 273 on-chip phase-detection points, it also performs at a similarly high level to its closest rival, the Sony A7 III, sharing many similarities in performance (albeit with some subtle differences). With its particular balance of performance characteristics at different ISOs, the Nikon Z 6 sensor will be a more appealing choice for a wide range of photographic applications than many previous, more conventional 20-24 MP sensors. In this review we have compared the Nikon Z 6 to its most direct rival and to relevant cameras we’ve tested among Nikon’s own lineup. As usual, you can create your own comparisons and in-depth analyses using our interactive image sensor ranking tool.